Judicial independence, integrity and impartiality are crucial to public trust in the judiciary. Justice must also be seen to be dispensed fairly and without fear or favour. 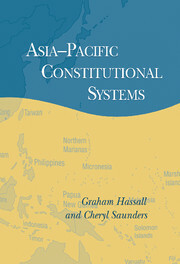 In the context of themes and perspectives as well as comparative theories of independence, this book provides a contemporary analysis of the role and independence of judges in fifteen countries in the Asia-Pacific. 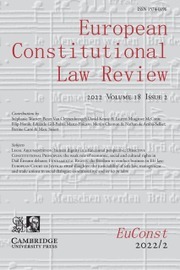 Expert analyses include countries that are governed by authoritarian governments or are beset by dramatic government changes, which undermine judges by attacking and preventing their independence, to more democratic countries where there are strides towards judicial independence. The problems confronting judges and courts are explained and analysed, with the aim of establishing a commonality of standards which can be developed to strengthen and promote the important values of judicial independence, impartiality and integrity. Solutions for the Asia-Pacific region are also proposed. 18. 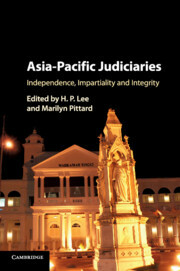 The challenges of judicial independence in the Asia-Pacific H. P. Lee and Marilyn Pittard. H. P. Lee, Emeritus Professor, held the Sir John Latham Chair of Law at Monash University, Victoria from 1995 to 2014, where he had also served as the Deputy Dean and Acting Dean. 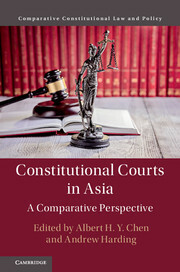 Professor Lee's many publications include Constitutional Conflicts in Contemporary Malaysia (2017), The Australian Judiciary (2013) and Judiciaries in Comparative Perspective (2011). He has published extensively on the judiciary, national security, and Australian and Malaysian constitutional law, and is on a number of advisory boards of prestigious law journals. He was awarded the Australian Press Council Medal in 2011. In 2015, he was appointed Emeritus Professor of Law at Monash University, Victoria. Marilyn Pittard, Professor of Law in Monash University's Faculty of Law, has served for twenty years as Associate Dean in Research, in Postgraduate Studies, in International Engagement and Acting Dean. With expertise in labour and employment law, and administrative law, she has recently published Labour and Employment Law (2015) and co-edited Business Innovation and the Law: Perspectives from Intellectual Property, Labour, Competition and Corporate Law (2013). 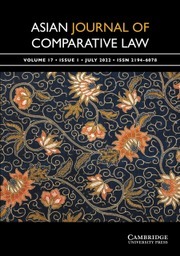 She has co-authored several editions of Australian Labour Law (2010) and co-edited Public Sector Employment Law in the Twenty-First Century (2011). Currently, she is Vice President of the Australian Labour Law Association; general editor of LexisNexis' Employment Law Bulletin; and founding and current editorial board member of the Australian Journal of Labour Law.